Currently, the manufacturing of self-actuating and self-sensing robots requires non-standard manufacturing techniques and assembly steps to integrate electrical and mechanical systems. In this work, we developed a novel manufacturing technique, where such robots can be produced at a flexible electronics factory. We developed the technique using standard industrial machines, processes, and materials. Using a lamination process, we were able to integrate air pouches or shape memory alloy (SMA) inside a polyamide-based flexible circuit to produce bending actuators. The bend angle of the actuators is sensed with a chain of inertial measurement units integrated on the actuator. Air-pouch actuators can produce a force of a 2.24N, and a maximum bend angle of 74 degrees. 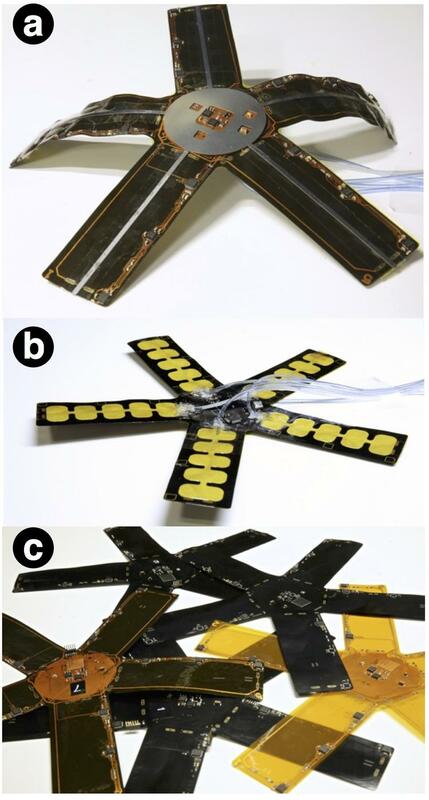 To demonstrate, we manufactured a five-legged robot with the developed actuators and bend sensors, with all the supporting electronics (e.g., microcontrollers, radio) directly integrated into the flexible printed circuit. Such robots are flat and lightweight (15 grams) and thus conveniently compact for transportation and storage. We believe that our technique can allow inexpensive and fast prototyping and deployment of self-actuating and self-sensing robots.